Fact-checking clearly isn’t a requirement at the Tribune, who’ve clearly forgotten that former Naval War College professor Alberto Coll was indicted following a counterespionage investigation. In 2005, Coll accepted a plea agreement in which he left Federal service, was striped of his security clearance, fined $5000, placed on probation, and banned from practicing law for a year. Coll’s lawyer, Francis Flanagan, indirectly acknowledged to the Associated Press his client was a (former) Naval Criminal Investigative Service source. Coll was regularly debriefed after his military-authorized visits to Cuba. HAVANA – (Associated Press) The start of talks on repairing 50 years of broken relations appears to have left Cuban President Raul Castro’s government focused on winning additional concessions without giving in to U.S. demands for greater freedoms, despite the seeming benefits that warmer ties could have for the country’s struggling economy. Following the highest-level open talks in three decades between the two nations, Cuban officials remained firm in rejecting significant reforms pushed by the United States as part of President Barack Obama’s surprise move to re-establish ties and rebuild economic relations with the communist-led country. In a wide-ranging interview, Vidal said that before deciding whether to allow greater economic ties with the U.S., Cuba is seeking more answers about Obama’s dramatic of loosening the half-century-long trade embargo. “I could make an endless list of questions and this is going to require a series of clarifications in order to really know where we are and what possibilities are going to open up,” Vidal said. Obama also launched a review of Cuba’s inclusion on the U.S. list of state sponsors of terrorism and Vidal said “it will be difficult to conceive of the re-establishment of relations” while Cuba remains on that list, which imposes financial and other restrictions. Vidal also said full normalization will be impossible until Congress lifts the many elements of the trade embargo that aren’t affected by Obama’s executive action — a step seen as unlikely with a Republican-dominated Congress. Among key prohibitions that remain is a ban on routine tourism to Cuba. She also said Cuba has not softened its refusal to turn over U.S. fugitives granted asylum in Cuba. Cubans said they were taken aback by the flow of information but wanted to know much more about what the new relationship with the U.S. means. “We’ve seen so much, really so much more than what we’re used to, about very sensitive topics in our country,” said Diego Ferrer, a 68-year-old retired state worker. Jesus Rivero, also 68 and retired from government work, sat on a park bench in Old Havana reading a report in the official Communist Party newspaper, Granma, about Jacobson’s press conference. Editor’s Note: Josefina Vidal is a career Directorate of Intelligence (DI) officer. Her identity has been corroborated by both US and former Cuban intelligence personnel. Havana long ago earned the nickname “Intelligence Trafficker to the World” for its sale and barter of stolen US secrets. Following the breakup of the Soviet Union and the loss of Moscow’s $3 billion annual subsidy, Cuba’s auctioning of US classified information skyrocketed. Defectors and émigrés report the island’s leadership sees America’s secrets as a commodity to be sold or traded to the highest bidder. These sources say Cuba’s intelligence brokering is now a key revenue stream, earning hundreds of millions of dollars annually in cash, goods, and services for the regime. Cuba’s intelligence and security services are undoubtedly celebrating the legacy-making breakthrough in US-Cuban relations ordered by President Obama. The US leader’s intentions – while noble – will be undercut by five apparently unanticipated consequences that will trigger an increase in Havana’s targeting of the United States. First, opening Cuba to American travelers will bring a huge influx of desperately needed cash to Cuban coffers – more specifically, the intelligence and security services that – along with their military brethren – run every major component of the tourism industry as profit-making enterprises. Second, an estimated million Americans are expected to visit Cuba yearly, as compared to the 60,000 US tourists it currently enjoys. This endless parade of Americans will provide Cuban spies unprecedented opportunities to assess and recruit new American traitors. Third, unrestricted access to US technology will allow Havana significant upgrades in the technical aspects of espionage and internal repression. While it may seem counterintuitive, Fidel and Raul Castro have long viewed the Cuban people as the greatest threat to regime survival. This explains why their two counterintelligence entities remain Cuba’s largest spy services. Conversely, the island’s three “foreign intelligence” services are directed against a single target – the United States. The fourth benefit Cuba receives is a huge enhancement in the long-cultivated notion that it poses “no threat” to the US. Spying against an unsuspecting enemy is infinitely easier than operating against a suspicious one. That’s the reason this well-choreographed myth has been aggressively promoted by major Cuban spies like Ana Montes and the husband-wife team of Kendall and Gwen Myers, as well as countless Castro apologists. The boost President Obama gave Havana with his new initiative elevates this myth to heights Havana could not have achieved by itself. The fifth and final gain will be the end of travel restrictions on Cuba’s US-based diplomat-spies, whose unrestricted travel is currently limited to a 25 miles radius from Washington DC and New York City. Open travel throughout the nation will be a godsend to Cuba’s espionage operations. 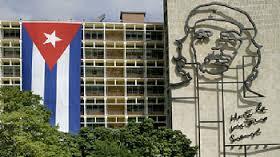 This new advantage will eventually be enhanced even further by the opening of Cuban diplomatic consulates and Prensa Latina news agencies from coast to coast. The combination of cash, US tourists, American technology, new diplomatic facilities and unrestricted freedom to travel will markedly improve the effectiveness and efficiency of Havana’s intelligence trafficking. In turn, this further incentivizes the regime to use this opportunity to drive up the profit margins and sales of US government and corporate secrets. A crown jewel in Havana’s intelligence arsenal is its network of communications intercept sites headquartered at Bejucal. This facility — Cuba’s equivalent to NSA — is the only “signals intelligence” site in the downlink of almost every US satellite. This gives Havana a unique competitive advantage the intelligence services of China, Russia, and Iran can only dream about. Several well-placed defectors said the volume of Pentagon, White House, NASA, and other US communications collected by Bejucal is so vast Cuba only had staffing to process the crème de la crème of stolen secrets. When the Castro brother’s pair this daily flood of material with the information and insights contributed by hundreds of human spies serving covertly throughout the US, the result is a terrifyingly real danger to the United States. Cuba is not a benign nation, but rather a hostile dictatorship that poses a significant, albeit one-dimensional threat to the United States. For example, the Castro regime has warned America’s enemies of every major military operation from the 1983 Grenada invasion through the most recent intervention in Iraq. Its spying has also resulted in the deaths of America citizens. Cuba is a police state and its apparatchiks respect one thing: power. As such, its spy services will see Washington’s olive branch as a sign of weakness. They will declare “open season” on the American government, its businesses, and Americans themselves to enrich and maintain the regime to which they have sworn their lives, loyalties, and families’ futures. In a throwback to the Cold War, a Russian spy ship caused a stir after unexpectedly docking in Havana on the eve of historic talks between the U.S. and Cuba. There was nothing stealthy about the arrival of the Viktor Leonov CCB-175, which was moored to a pier in Old Havana where cruise ships often dock. But the visit was not officially announced by Cuban authorities. The timing also raised eyebrows as it came on Tuesday, the eve of historic U.S-Cuba talks aimed at normalising diplomatic relations. U.S. officials in Washington played down the presence of the Russian vessel, saying it was perfectly legal and not at all out of the ordinary. ‘It’s not unprecedented. It’s not unusual. It’s not alarming,’ a defense official told AFP news agency. 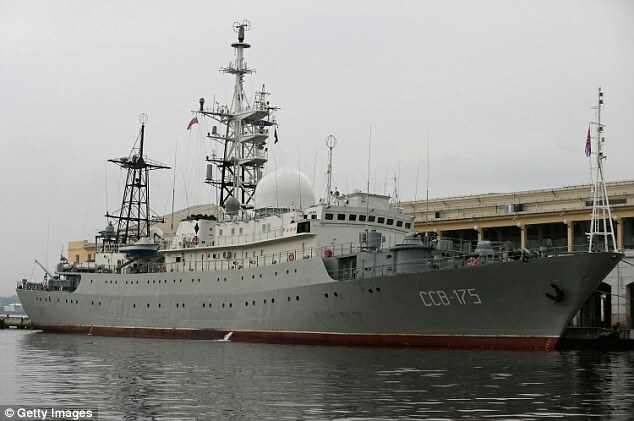 The Vishnya or Meridian-class intelligence ship, which has a crew of around 200, went into service in the Black Sea in 1988 before it was transferred seven years later to the northern fleet, according to Russian media. The vessel previously docked in Havana in February and March last year, staying there for a few days. Those visits were also unannounced. The Russians said the visit was scheduled a long time ago and was yesterday opened up for the children of Russian diplomats. For Cubans, who became increasingly dependent on Russia after the 1959 revolution, the ship’s latest visit has taken them down memory lane. Raphael Hernandez told ABC News: ‘We have normal relations with Russia. The highest-level U.S. delegation in 35 years will conclude two-day talks in Havana today with both sides cautioning an immediate breakthrough was unlikely. Senior U.S. officials say they hope Cuba will agree to reopen embassies and appoint ambassadors in each other’s capitals in coming months. The United States also wants travel curbs on its diplomats lifted and unimpeded shipments to its mission in Havana. Read more: Cold War Spy Games? Two career Cuban spies, Josefina Vidal Ferreiro and Gustavo Machin Gomez, will lead this week’s migration and normalization discussions with the United States. The pair are members of Cuba’s primary foreign intelligence service – the Directorate of Intelligence (DI), and serve as Director and Deputy Director, respectively, of the North American Division in the Ministry of Foreign Affairs (MINREX). This is Machin’s second time in the Division, having served as Deputy Chief in 2003 and Division Chief from 2004-2005. 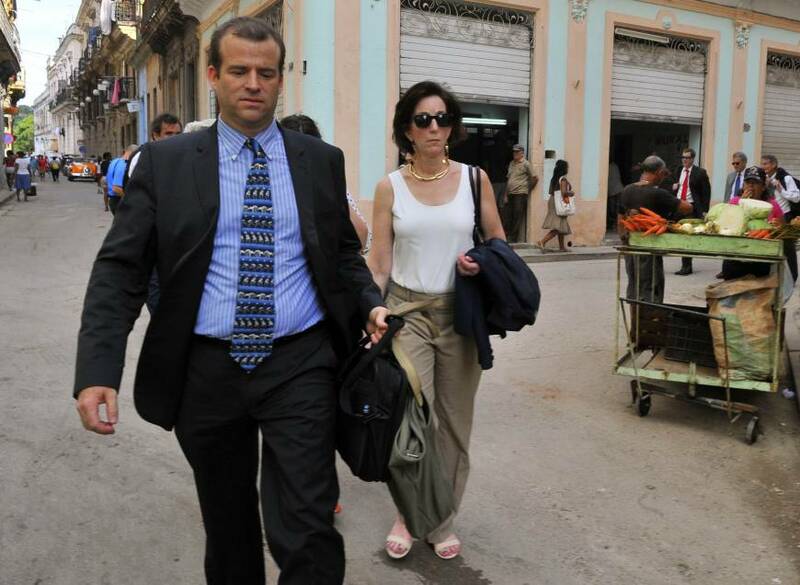 As Havana’s lead “diplomats” on U.S.-Cuban relations, they handled the Alan Gross negations, the return of three of Havana’s jailed spies, and the artificial insemination of DI officer Adriana Perez O’Connor (wife of freed spy Gerardo Hernandez). Perez herself was a member of the Wasp Network – the largest Cuban spy ring ever known to operate in the US. Incidentally, when details are eventually released regarding the Obama administration’s secret talks to restore US-Cuba relations, Vidal and Machin will undoubtedly be at the center of events. From the DI’s perspective, MINREX’s North America Division is now seen as a de facto wing of the spy service. This assignment is so important that three former members were appointed to ambassadorships. Now we are witnessing the unprecedented return of Ambassador Gustavo Machin to serve as Josefina Vidal’s deputy. Given this pattern of events, I think it’s fairly safe to say Vidal is Raul Castro’s choice to be the first Cuban Ambassador to the United States. Little is publicly known about Vidal’s espionage career. In May 2003, the US expelled 14 Cuban diplomats for espionage. Seven diplomats were based at the Cuban Mission to the United Nations and seven at the Interests Section. Among the seven Washington-based spies declared Persona Non Grata was First Secretary Jose Anselmo Lopez Perera. His wife, First Secretary Josefina Vidal, also known to the US as a Cuban Intelligence Officer, voluntarily accompanied her expelled spouse back to Cuba. Previously, Vidal’s lone known success was her support to the influential Council on Foreign Relations (CFR); in particular, Julia E. Sweig, a CFR Senior Fellow and Deputy Director of the Latin America Program. In her book, Inside the Cuban Revolution: Fidel Castro and the Urban Underground, Sweig profusely thanked six Cuban spies for assisting her with her research. The six intelligence officers were Jose Antonio Arbesu, Ramon Sanchez Parodi, Fernando Garcia Bielsa, Hugo Yedra, Jose Gomez Abad and Josefina Vidal. The son of a revolutionary hero, Gustavo Machin Gomez, was expelled in November 2002 in retaliation for the Ana Belen Montes case. In 2003, he was Deputy Director of MINREX’s North America Division and Chief the following year. In 2006, he was appointed Cuba’s first ambassador to Pakistan, where he is believed to have targeted US counterterrorism operations in the region. He then returned home to head the International Press Center before his current assignment. DI officer Johanna Tablada preceded Machin in his second tour as Deputy Division Chief before her appointment as ambassador to Portugal. She was suspected of being assigned to Department M-I, the elite element focused on targeting the US intelligence community, universities, and Congress. 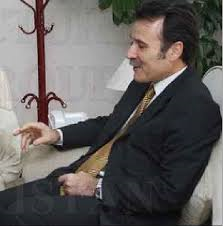 Eduardo Martinez Borbonet previously assisted Vidal as a Counselor in the North America Division. In November 2011, two weeks after a landslide victory propelled longtime Havana-ally Daniel Ortega into a controversial third term, he became Havana’s ambassador to Nicaragua. In late December 1998, First Secretary Martinez Borbonet was expelled for his involvement in the South Florida based Wasp Network. The diplomat-spy served at the Cuban Mission to the United Nations (CMUN), the traditional hub for Havana’s US-based espionage operations. He had arrived approximately eight years earlier as a lowly Third Secretary. They speak with a confidence and a candor unusual among Communist officials of their generation, who rarely veer off-script or show emotion. 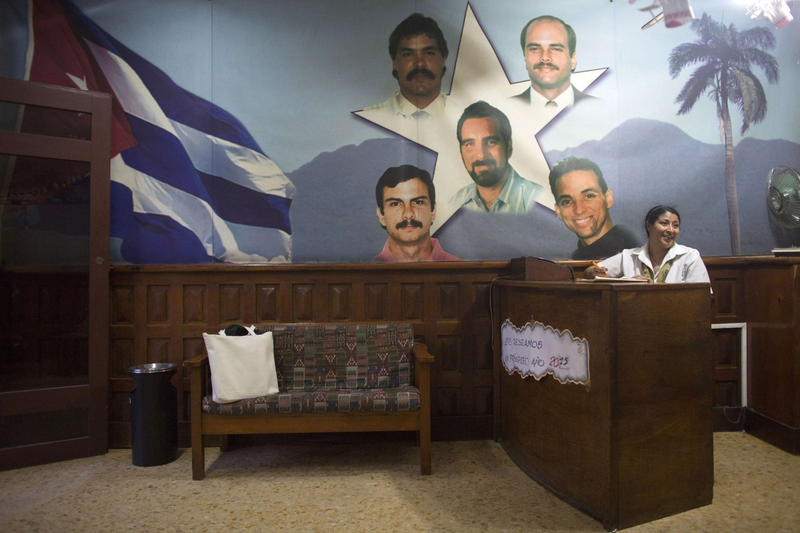 Despite their years behind bars, the men are relatively young, at least by Cuban leadership standards. And with each public appearance, more Cubans and Cuba-watchers wonder what role the five, and especially ringleader Gerardo Hernández, might play in the country’s political future. Although several of them had not set foot on the island in 20 years, Havana’s ceaseless international campaign to free the men has arguably made them the most recognizable faces in the Cuban government after the Castros. A generation of Cuban schoolchildren has grown up memorizing their names and biographies. Hernández, 49, was serving two life sentences plus 15 years when he was freed as part of the prisoner swap for a long-jailed CIA mole in Cuba that also triggered the release of Alan Gross, an American government subcontractor. Sent by Havana to infiltrate anti-Castro groups in Miami, Hernández was convicted of conspiracy to commit murder, having passed along information that Cuba used in the 1996 downing of two civilian planes operated by the exile group Brothers to the Rescue, killing four. “It was worth it,” he said. The agents have said nothing specific about their plans. But when the Obama administration agreed to send them back, it possibly gave Cuba more than a group of intelligence operatives. Editor’s Note: The Washington Post is incorrect in reporting the Wasp Network was created “to infiltrate anti-Castro groups in Miami.” It actually targeted US military bases, the FBI, the Miami Herald, local and national political figures, and other groups. Directorate of Intelligence (DI) officer Josefina Vidal, thrown out of the US in May 2003 for espionage. 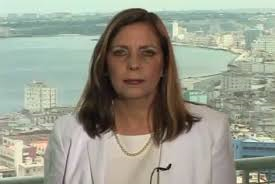 As predicted, a Ministry of Foreign Affairs (MINREX) statement released yesterday confirmed that Josefina Vidal Ferreiro, head of the Ministry`s US affairs section, will lead the Cuban delegation. The first day’s topic remains immigration, while on day two, the two nations will discuss the principles and process to reestablish diplomatic ties and open embassies. A Cuban national imprisoned for nearly two decades as an American spy is now in the United States, his family said Tuesday, the first confirmation of the former U.S. agent’s whereabouts since he was released in last month’s deal to overhaul ties with Cuba. 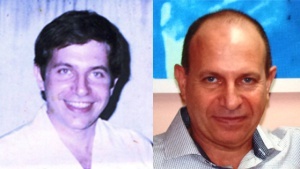 Rolando Sarraff, a cryptographer with Cuba’s Directorate of Intelligence, was imprisoned in 1995 on suspicion that he was passing secrets to the United States. Information provided by Sarraff helped U.S. officials dismantle networks of Cuban spies in the United States, one illustration of the mutual hostility that characterized U.S. dealings with Communist Cuba for more than 50 years. The White House secured Sarraff’s release last month as part of President Obama’s sweeping agreement to thaw U.S. ties with the island nation. The deal also included the return of an American aid contractor held by Havana and the release of three Cuban intelligence agents imprisoned in the United States. But since the deal was announced Dec. 17, Obama administration officials have declined to confirm whether Sarraff was taken to the United States, or whether he was in U.S. government custody somewhere else. For weeks, family members in Cuba, Spain and the United States said they had not been informed by either the U.S. or the Cuban government about his whereabouts. This week, his sister, who lives in Spain, said she finally heard from her brother. “He’s well, and he’s in the U.S.,” Vilma Sarraff told The Washington Post. She declined to give details. Missy Ryan writes about the Pentagon, military issues, and national security for The Washington Post. The next round of US-Cuban discussions will be held on January 21 and 22 in Havana. Deputy Assistant Secretary Alex Lee is expected to lead the U.S. delegation at the migration talks on the 21st, while Assistant Secretary of State for Western Hemisphere Affairs Roberta Jacobson will lead at the normalization talks on Jan. 22nd. 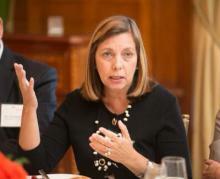 The Cuban delegation is expected to be led by Josefina Vidal, director of the North American Affairs Division within Cuba’s Ministry of Foreign Affairs. Vidal led the previous round of migration talks last July in Washington, D.C. A member of the Communist Party of Cuba’s Central Committee, Vidal was thrown out of the US in May 2003 as part of a mass expulsion of Havana’s spy-diplomats. For five years, her office also played a central role in the negotiations regarding the return of USAID contractor Alan Gross. HAVANA — The wife of a Cuban intelligence agent freed by the United States has given birth to a girl after a pregnancy made possible by negotiations to improve ties between the two countries. The Communist Party daily Granma says the baby named Gema was born Tuesday and weighs 7 pounds and 1 ounce (3.2 kilograms). U.S. officials helped facilitate a process of artificial insemination so that convicted spy Gerardo Hernandez and his wife Adriana Perez could have a child. It came during talks that led the U.S. to release Hernandez and two other agents last month and the announcement of plans to restore normal diplomatic relations between the U.S. and Cuba. Cuba, meanwhile, freed imprisoned U.S. aid worker Alan Gross. Corrected Editor’s Note: Both Gerardo Hernandez and Adriana Perez work for the Directorate of Intelligence (DI). As part of the Wasp Network, her mission was to courier messages and material between Havana and Miami. She was still in training when her husband and nine other Wasp Network members were arrested in September 1998.